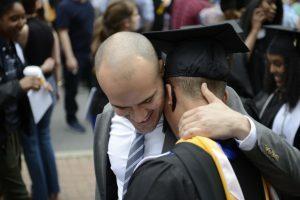 At its 93rd annual commencement Saturday, May 14, The College of Saint Rose celebrated its enduring mission, while graduates were urged to embrace global understanding. More than 1,500 bachelor’s degrees, master’s degrees and certificates of advanced study were awarded from the College’s four schools, in a ceremony that filled the Times Union Center in downtown Albany. 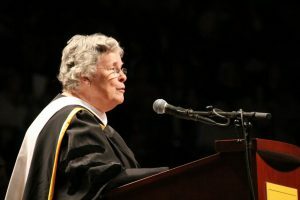 President Carolyn J. Stefanco, who asked the alumni in the audience to stand, noted that Saint Rose now has 42,000 graduates hailing from 37 countries and all 50 states. 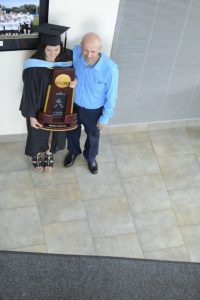 She encouraged the newest graduates to think globally. 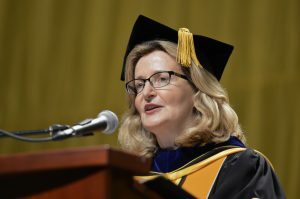 The 11th Saint Rose president, the first person in her family to go to college, said that it was not until finishing graduate school that she appreciated the role so many individuals played in moving her from community college to college professor. Sister Katherine, a Saint Rose alumna, lifelong educator and spiritual director, said Saint Rose students are, in fact, continuing the legacy of service embodied by the Sisters of Saint Joseph of Carondelet, who founded the College almost 100 years ago. This is especially evident during Reach Out Saint Rose, the annual day of service. 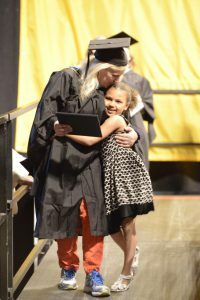 Tracey Pacelle, who earned a master’s in education and a certificate of advanced study, spent commencement with her daughter, Serene, 7. Mother and daughter walked hand-in-hand in the academic processional, sat together and exited the ceremony together, though Serene did not accompany her mother across the stage to receive her diploma, her second master’s degree. “I wanted her to set the bar high and show her what she could achieve,” explained Pacelle, a sixth grade special education teacher in the Bronx, as her daughter looked on. 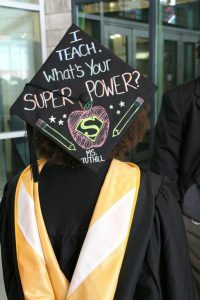 On her mortarboard, Jazzmyn Tuthill wrote “I Teach. What’s your Super Power?” She said her Saint Rose education had given her not just strong academics, but also experience teaching refugees, children with autism and local children in an after-school program near campus. For her mother, Sheree, the most meaningful moment of the ceremony was one of the last, when Barbara R. Schirmer, the interim provost, described the power of helping the world one person at a time. To illustrate, Schirmer told the story of the small boy who came upon a beach full of stranded star fish and threw as many as he could back into the ocean, one by one. 2011 NCAA Division II National Soccer Championship. It was an honor the decorated player, an intrepid forward, was instrumental in winning. And she was the last remaining Saint Rose student from that championship squad. Now, she reflected a bit as she hoisted the heavy trophy and her family snapped photos.